Government subsidized start-up loans look very attractive in credit-based poverty alleviation. Some poverty-stricken people dare not try them for fear of business failure and inability to repay them. However, Zhaisha Dong villagers at the foot of Mount Fanjing in Jiangkou County of southwest China’s Guizhou Province have enjoyed this preferential pro-poor approach and benefited considerably. 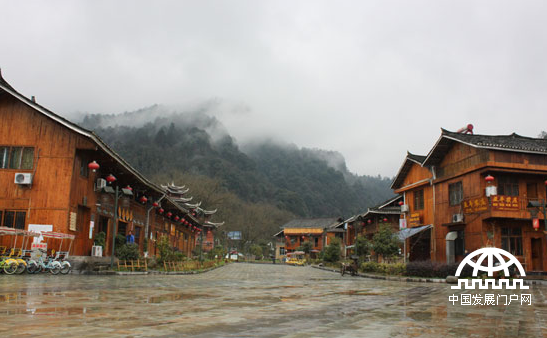 On January 14, 2016, the featured program centered on the theme of "Poverty Alleviation in Guizhou, Online Media Marching the Path of Transformation and Reform" has reported on Zhaisha Dong Village, a place rich with Dong minority traits where there are towering old trees, murmuring streams, winding paths and zigzagging corridors. For the 76 households of 304 people who live there, almost everyone has started an "agritainment" farm business and they are friendly, hospitable and talented. How can one imagine what this busy stockade village once was a few years ago? People there lived in shabby houses with a per-capita net income of less than 1,000 yuan, girls who got married outside refused to return to their parents’ poor homes, and boys made a living by doing hard physical labor. In 2011, the poverty rate reached 49.3 percent with 37 poverty-stricken households, while only 14 people from 3 households now live under the new poverty line. In just fjve years, what turned a "poor pheasant" into a "golden phoenix"? "For credit-based poverty reduction," Xia Defa told the reporter. "In the beginning, people lacked the courage to apply for loans. Guided by the government in the first round of house construction, we summoned our courage and applied for house renovation." Xia, a member of the local Dong minority who had lived here for 48 years, and labored for 11 years with an annual income of only 10,000 yuan, applied for a 50,000 yuan loan and borrowed over 200,000 yuan from friends and relatives to build "Shunkang Dongzhuang Agritainment", thus becoming one of the first groups who rose out of poverty to wealth with an annual income of over 200,000 yuan. 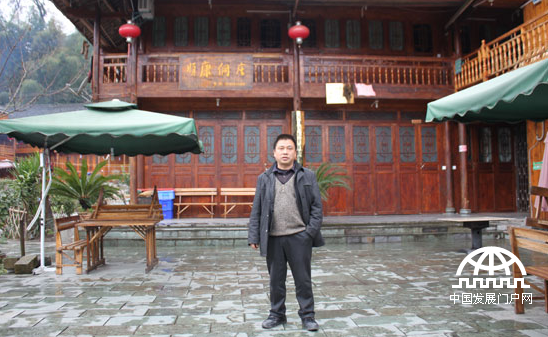 Nowadays, he has paid off his loans, lent the "agritainment" venue to urban citizens with rents reaching 80,000 yuan, lived in a few rooms, and worked part time for the tenants when he is free. President Xi Jinping cares a lot about poor people, anti-poverty and development programs, and highlighted "the key to realizing a moderately prosperous society lies in the people," and "whether government policies work or not is reflected in the people’s lives." Xia Defa told the reporter that he named his "agritainment" center "Shunkang Dong Home" in the hope that everything would be as good as the name "Shunkang" indicates. Xia Defa is not alone and there are a lot more who have gained substantially from credit-based poverty alleviation efforts, and they walked the road to a better life with confidence and a big smile. In recent years, the central government has paid heed to poverty alleviation through credit support, and has come up with policies like the "Comprehensive Guidance on Financial Services for Poverty Reduction and Development." Zhaisha Dong Village in Jiangkou County succeeded in targeted poverty reduction thanks to credit support and atourism based approach. In the mean time, it has gained the following titles, namely, the National Pro-poor Credit and Rural Tourism Model Village, Top 100 Guizhou Cultural and Rural Tourism Demonstration Site, National AAA Level Scenic Spot and National Rural Pro-poor Tourism Demonstration Site. Governmental leadership has played a pivotal role in Zhaisha through a credit approach to poverty reduction. Jiangkou County followed the schedule of poverty alleviation strictly.It identified the poor population through looking into the per-capita incomes of rural residents, poor people, and farmers, and applied for the credit support of 16,360,000 yuan from the China Development Bank (CDB), the Agricultural Bank of China (ABC) and Credit Union. Concerning the Zhaisha model, the deputy county chief of Jiangkou County said that two major problems were solved in the pro-poor credit approach. One is the building up of the credit guarantee platform so that banks are assured to lend money. Another is to fully develop pro-poor industries so that people see the benefits in applying for loans. In this way, a pro-poor credit mechanism is established where people get loans from banks under the governmental guarantee while enjoying interest rate subsidies.